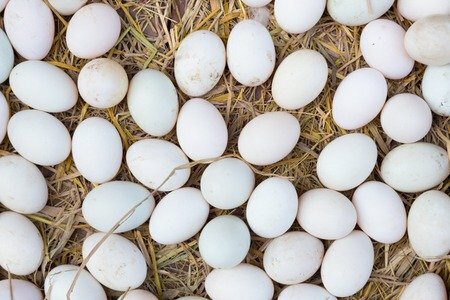 This beautiful picture of eggs illustrates that even amongst white there are many shades. Shades of white can range from nearly pure white to whites subtly tinted with color. In a paint chip book you can see the range of white that on their own look purely white but when placed side by side show their undertones of different shades. When choosing white for walls, floors or furniture, there is a white for everyone and every room. Creamy whites can be easier to live with than pure whites. Whites that have undertones of cream or yellow lend a warmer tone to a room. Off whites that have a slight tan or brown undertone can also warm up a space and are good choices for slipcovers and furnishings. Pure whites are better in hard surfaces like trim and cabinetry that can be easily cleaned. A pure white rug or carpet will show dirt more than a rug that is more off white or slightly tinted with grey undertones. White slipcovers can be washed and even bleached, check with your slipcover’s labeling before bleaching. Many people are afraid of using white in their décor. If this is you, take a look at those white paint chips or even farm fresh eggs. You’ll see that white can be more blue, or pink, or even green. Finding the right undertone to the white will make it work for your interior. Whites can also be layered to create a subtle palette that has just a hint of color. Our tile comes in many shades of white, but you won’t be alone in choosing what is best for you. Feel free to ask our Showroom Consultants for the expert help. We are here to guide you to the perfect floor for you!